The innards of the videogame industry are dark, mysterious, and just a little bit icky. According to a recent article by Leigh Alexander, not all is merry for our game developers this holiday season. Some people who have put in a lot of work are being ignored, by publishers and gamers alike. Maybe, as Joshua Lin describes, we need more videogame celebrities as advocates and representatives. Join Scott and I while we discuss labor disputes, the Joss Whedon appeal, developer secrecy, and the hidden ailments of the games industry. 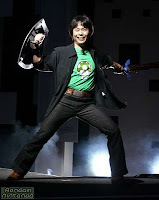 - Do you treat any game developers as celebrities? Does the games industry more outspoken and charismatic individuals? - How much do you know about who makes your games? Are the majority of gamers tragically misinformed or blissfully ignorant? On the subject of an imdb like site for those involved in videogames; the giantbomb site whose podcast you've mentioned a few times has something like this. In particular, each company that has a wiki entry there also has a related page for employees of the company. Those employee pages can then be linked to specifc games. I think you mentioned this in your show, but it seems like one of the things that would help the recognition would be if there was a bit more publicity and a bit more understanding about who does what in game development. Thanks for the reminder about Giantbomb. If publishers drop the ball on crediting people for work, it's good to know that the collective wisdom of the Internet can work to keep them honest. Remember the Jade Raymond hype, before the first Assassin's Creed came out? It felt as if she was even more important than the game. I don't think the industry needs more hype around specific individuals, for example I'm not sure if the rockstar like behaviour of Tomonobu Itagaki(Team Ninja) did "his" games any good. I like the idea of an "Igdb" though, although as an industry outsider I'd be interested in how much of a difference a single individuum in a large project really can make. For example, if you like the animations in a specific game, check out the responsible programmer and check out other games that he was involved in, does this mean that the animations in the other game are probably equally good? Maybe the budget was considerably lower for this game? Same goes for designers, how can you really know how much and what parts of FarCry2 were actually Clint Hockings "work"? How do you know, that there isn't the big publisher that pulls the strings after all? Something like: Yeah Mr. Hocking we know what you mean, but FarCry3 just needs to have pre-rendered cutscenes, so just do it!" I noticed the Jade Raymond thing with AC 1. Equally conspicuous was her absence from the AC 2 hype machine. I'll have to look it up to see if she even worked on it. Good point about all the factors that go into a game's outcome. Maybe once a designer amasses enough work, it will be more clear how much influence their budget and publishers have over their creation. "For example, if you like the animations in a specific game, check out the responsible programmer and check out other games that he was involved in, does this mean that the animations in the other game are probably equally good? Maybe the budget was considerably lower for this game?" The answer to this is more complex than a single person's work. For one thing, programmers do not animate(typically). I can animate the same animation in two different games, but if a designer/programmer doesn't make it feel responsive and the model doesn't look as good it won't be the same animation. Anyhow, imo this new style of celebrity developer only works when there is a great team to back up a great vision. This is where game produces and lead developers may want to seize our attention. Part of their job is to corral others. Maybe even publishers should take some celebrity glory.